Elastic "O" rings expand enough to allow them to be slid over the tail or scrotum (including testicles) and then released at the desired point. Ring steadily squeezes shut all arteries supplying either area with blood. Without blood, tail & scrotum dry up and drop off over a period of 10 - 20 days. The "O" ring container keeps rings together in one spot in the lambing barn. Also the special lid (similar but larger than a breath-mint lid) allows user to tip out 1 ring at a time. 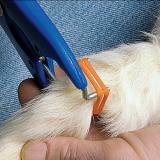 To expand the "O" rings, use our Ring Expander or Blue Ring Expander. 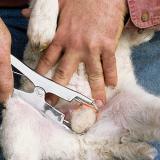 Castrating and docking lambs and goat kids. 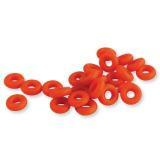 When putting rubber "O" rings on your ring expander, turn or twist them on about half way down. When you roll them on, they seem to go all the way down and this makes it harder to get off the expander when banding a lamb or goat. 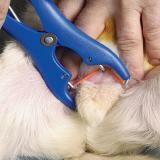 Failing to ensure that both testicles are actually in the scrotum below the ring (tricky with baby lambs & kids). Applying rings before a lamb is 24 hours old, up on its feet, nursing and active may interrupt nursing and thus predispose lamb to rapid death from E. coli problems ("watery mouth"). Many wait a day or two to apply on twins, triplets and orphan lambs. 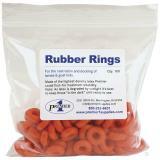 Rubber rings can cause tetanus. Be sure to vaccinate ewes or does with a booster dose prior to parturition. "O" rings from all sources occasionally break so it is best to double check a week later. 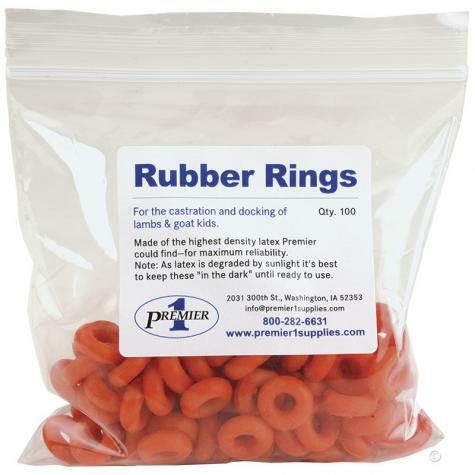 Expands rubber o-rings during docking and castrating. Lowers chances of fly-strike. A simple product that has not gotten better by being modernized. Too inconsistent. Brand new batch, first group of lambs, and some bands slide right on the tool, no effort. 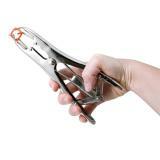 We have bought new ones each of the last three years, store them as recommended, same experience. They make a simple job suddenly very problematic. I checked that I wouldn't recommend, but what are the real options? After 40 years and 1000's of lambs, it's disappointing. Quick turnaround time from ordering to delivery and these bands work great. Always a great experience. Priced well. Seamless transaction from beginning to end. Quality product. Delivery was quick. Will use this company and this product again.